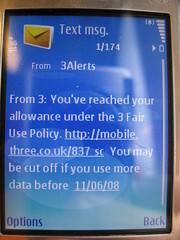 The 3 Loyalty team just called me, to extend my contract with a tantalising “upgrade offer”. No thanks, I don’t want the new phone you’re offering. The aforementioned cancellation policy is ridiculous. What happens if I need to be out of the country on the 10th of October? A one day window for a customer to cancel an 18 month contract without incurring fees should be against the law. I would have to sign up for at least another 18 12 months. No I want a rolling contract. I could not get my phone unlocked. My phone must be unlocked as I am not going to use my (UK) 3 SIM in foreign countries like Israel. So far the most attractive offer for a ‘SIM only’ rolling contract (one month cancellation) is from Vodafone. Some minutes&texts with 1G fair usage data for 22.50GBP a month. I must double check that. Anyway there is still a bit of time between now and November. I hope my Nokia E65 will last that long. I want to ideally buy an unlocked Android phone and failing that… an Iphone 3G. Nooo… I’d rather keep using my Symbian Nokia E65 out of principle!